Biostar has announced a new motherboard that has been designed from the ground up for the mining community. Known as TB150 Pro the motherboard features the latest Intel LGA 1151 socket and comes with a special design that ensures the most stable operation under mining programs. As seen from the name the Biostar TB150 Pro is based on the Intel B150 chipset and this means it has been designed to work with Skylake processors. The board has two memory slots that can house up to 32 GB of DDR4-2133 or DDR4-1866 memory, a LGA 1151 socket that can work with Skylake processors with TDP of up to 91W, two PCI-E 3.0 x16 slots (at x16 and at x4 speed), three PCI-E 3.0 x1 slots, six SATA 3.0 connectors, one M.2 connector, Realtek ALC887 sound and Realtek RTL8111H networking, a number of USB ports and various connectivity options at the back. The board uses the popular ATX form factor. 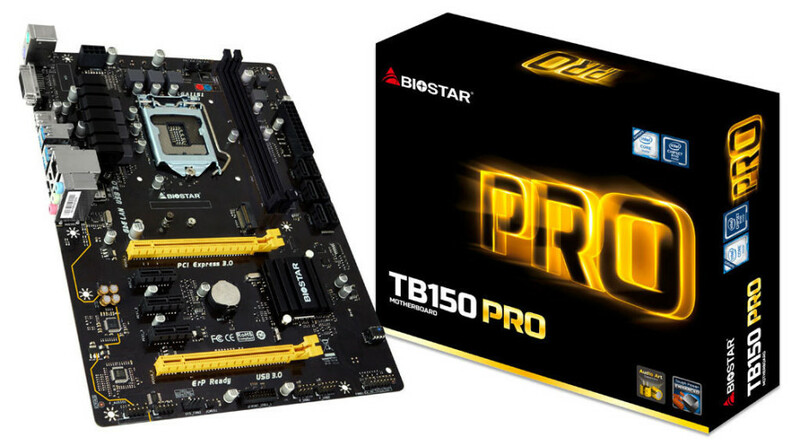 The new Biostar TB150 Pro motherboard can be had for USD 79.99.